Founded on March 4th 1974 Switchboard’s information and support helpline operated for five hours every evening in a small room above a bookshop near Kings Cross Station, London, UK. Because of almost immediate, rapidly increasing demand, it soon became a 24-hour service. We have provided support and information to millions of people since our phone started ringing in 1974. Throughout our history, we have been at the forefront of supporting our communities in facing the issues of the day. In the 1970s, we helped support people coming out after the 1967 partial decriminalisation of male homosexuality and provided much needed signposting to the newly developing ‘gay scene’. In the 1980s we were the leading source of information on the then new and unknown disease of HIV/AIDS. As the effect on our communities became apparent, we collated and maintained a detailed manual of the latest and most up-to-date information available. We not only shared this with the many frightened callers to our helpline but also with the general public, as our volunteers staffed the BBC helplines to take calls after programmes about HIV and AIDS. Organising a public meeting in 1983, our volunteers went on to set up some of the up the UK’s leading HIV charities, such as Terrence Higgins Trust (THT) and National AIDS Manual (NAM). 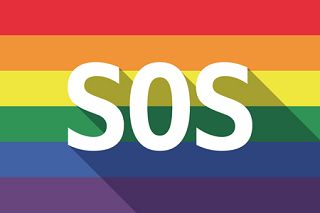 In the 1990s our support for the lesbian, gay, bisexual and trans communities was never more evident than throughout the aftermath of the bombing of the Admiral Duncan pub in Soho, London, UK in 1999, when volunteers not only answered hundreds of calls from concerned friends and relatives, but also helped many people deal with the after-effects of the attack in the following months. In the new millennium we have witnessed huge changes in legal equality and LGBT+ information is much more accessible, however our services are still very much needed. We continue to provide support on the phone, and through our email and instant messaging services, to people from across the UK and further afield. They may be feeling isolated in their community, they may be coming out and want to talk to somebody who has also been through it, they may have an issue that is concerning them and need to talk it through with somebody who will not judge them, they may want to ask how to put a condom on without being embarrassed, or they may just need to know where they can meet other people in their area. Our volunteers will continue to provide support and information to these people until the day our phones stop ringing. Our lines remain open everyday of the year from 10am to 10pm (GMT). 1. We talk things through. We don’t finish a call until you tell us. 2. Everything is confidential. You can trust us. We are a proud supporter of the Switchboard. With every purchase in our proudSHOP UK, you support the project with 15% of our profit.